Sigiriya, in fact, should have been classed as one of the Wonders of the Ancient World, long ago, and there is now a proposal to name it as the Eighth Wonder of the world. Perhaps, it is better late than never! Sri Lanka's ancient architectural tradition is well portrayed at Sigiriya, the best preserved city centre in Asia from the first millennium, with its combination of buildings and gardens with their trees, pathways, water gardens, the fusion of symmetrical and asymmetrical elements, use of varying levels and of axial and radial planning. Sophisticated city planning was at the heart of Sigiriya, this royal citadel of ancient fame from the days of Sri Lanka's memorable past. The Complex consists of the central rock, rising 200 meters above the surrounding plain, and the two rectangular precincts on the east (90 hectares) and the west (40 hectares), surrounded by two moats and three ramparts. The plan of the city is based on a precise square module. The layout extends outwards from co-ordinates at the centre of the palace complex at the summit, with the eastern and western axis directly aligned to it. The water garden, moats and ramparts are based on an echo plan duplicating the layout and design on either side. This city still displays its skeletal layout and its significant features. 3 km from east to west and 1 km from north to south it displays the grandeur and complexity of urban-planning in 5th century Sri Lanka. The most significant feature of the Rock would have been the Lion staircase leading to the palace garden on the summit. Based on the ideas described in some of the graffiti, this Lion staircase could be visualised as a gigantic figure towering majestically against the granite cliff, facing north, bright coloured, and awe-inspiring. Through the open mouth of the Lion had led the covered staircase built of bricks and timber and a tiled roof. All that remains now are the two colossal paws and a mass of brick masonry that surround the ancient limestone steps and the cuts and groves on the rock face give an idea of the size and shape of the lion figure. Though traces of plaster and pigments occur all over this area, there are only two pockets of paintings surviving in the depressions of the rock face, about a 100 meters above the ground level. These paintings represent the earliest surviving examples of a Sri Lanka school of classical realism, already fully evolved by the 5th century, when these paintings had been made. 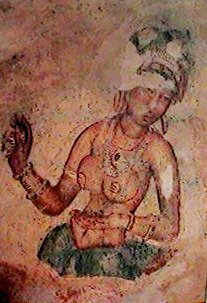 Earlier the Sigiri style had been considered as belonging to the Central Indian school of Ajanta, but later considered as specifically different from the Ajanta paintings. 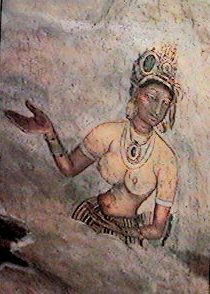 The ladies depicted in the paintings have been variously identified as Apsaras (heavenly maidens), as ladies of Kasyapas court and as Lightening Princess and Cloud Damsels. The Sigiri Gardens blend together to make the perfect setting for the Lion Mountain. Only the southern side of the garden has been excavated, leaving the identical northern half for the archaeologist of the future. In the entire Sigiri-Bim, over 200 village tanks and rural sites have been investigated. The water gardens of the western precinct are symmetrically planned, while the boulder garden at a higher level is asymmetrically planned. The water garden displays one of the worlds most sophisticated hydraulic technologies, dating from the Early Historic Period. This shows an interconnection of macro- and micro-hydraulics to provide for domestic horticultural and agricultural needs, surface drainage and erosion control, ornamental and recreational water courses and retaining structures and also cooling systems. The Macro system consisted of the Sigiri Maha weva, the manmade lake with a 12 km dam, running south from the base of the rock, a series of moats, two on the west and one on the east fed from the lake. At micro level are, the water control and the water retaining systems at the summit of the rock and at various levels with horizontal and vertical drains cut in to the rock and underground conduits made of cylindrical terracotta pipes. The miniature water garden just inside the inner wall of the western precinct, consists of water pavilions, pools, cisterns, courtyards, conduits and water courses. The pebbled or marbled water-surrounds covered by shallow slowly moving water would have served as cooling devices with an aesthetic appeal with visual and sound effects, which could be visualised by a visitor who could spend a little time. The largest water garden has a central island surrounded by water and linked to the main precinct by cardinally-oriented causways. This was created 5 centuries before those at Angkor in Cambodia or Mughal gardens in India. The central island would have been occupied by a large pavilion. The water is in four L-shaped pools, connected by underground water conduits at varying depths, to provide different water levels. The pool on the south-west, is divided into a large bathing pool, with a corbelled tunnel and steps leading down into it. The other pool is smaller with a central boulder on which was a brick-built pavilion. The fountain garden is a narrow precinct on two levels. Western half has two long and deep pools, with shallow serpentine streams draining into the pools. These had been paved with marble slabs. These streams display the fountains, which have been made from circular limestone plates with symmetrical perforations, which are fed by underground water conduits and operate by gravity and pressure. There are two shallow limestone cisterns which would have served as storage and pressure chambers for the fountains. These fountains are still active during the rainy season from November to January. On either side of the fountains are four large moated islands , oriented north-south, cutting across the central axis of the water garden. This too shows the symmetrical repetition. The flattened surfaces of the islands were meant for the Summer Palaces or water pavilions. Access to the pavilions were across bridges cut into the surface rock. The Octagonal pond is at a point where the water garden and the boulder garden meet, a still higher level from the rest of the water garden. It is at the base of a towering boulder. There is a raised podium and a drip ledge, which would have formed the bathing pavilion . The pond is surrounded by a wide terrace also octagonal. The entrance to the inner citadel (15 hectares) is made of a massive brick and stone wall, which forms a dramatic backdrop to the water garden and to the rock and the palace on the summit towards the east of it. The wall runs from the Octagonal pond to the bastion on the south-east, which is formed of wide brick walls linking a series of boulders surrounding a cave pavilion with a rock-cut throne. The Terrace Garden at the base of the rock is fashioned out of the natural hill , made with rubbled retaining walls, each terrace running in a concentric circle around the rock, each rising above the other. Sigiriya was no mere fortress, gloomy and forbidding. At the brief height of its glory-it was a royal citadel for more than 18 years, from 477 to 495 A.D. and one of the loveliest that have graced this land. There are many interpretations of the Sigiriya period, history replete with legend, love and betrayal. But one story remains, the story of Kaspaya (477-495 A.D.) its creator, King with an artist's soul. Bards have written about him and plays and film have tired to capture his personality. Kasyapa left Anuradhapura and built for himself at Sigiriya, a palace and city modelled on the mythical abode of "Kuvera" God of Wealth. He gave form to his dreams of grandeur. Eighteen years later, his half-brother Moggallan challenged him with an army. By one of those momentary mistake of judgement that changes the course of history. Kasyapa thought he was alone in battle, raised his dagger and slew himself. 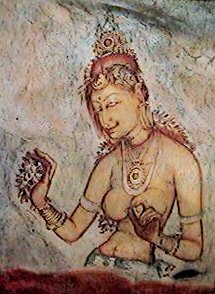 In a sheltered pocket on the western face of the Sigiriya rock, approached by a spiral stairway, are the famous frescoes. Epigraphical evidenced refers to the existence of 500 such portraits, but only 19 remain today. On the western and northern sides of the steep rock face runs a gallery or pathway which provides access to the seemingly inaccessible summit. Shielding this pathway is a 9 1/2 ft. plaster wall, so highly polished, that even today, after fifteen centuries of exposure to sun, wind and rain, one can see one's reflection in it. Hence the name "Mirror Wall". On the polished surface are the Sigiri Graffit recorded by processions of visitors to the rock in the past. 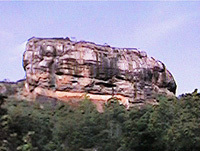 The summit of the rock is nearly three acres in extent. The outer wall of the palace which is the main building was constructed on the very brink of the precipice. There were gardens, cisterns and ponds laid out attractively. The pleasure garden of the western side of the rock is studded with ponds, islets, promenades and pavilions. Some underground and surface drainage systems have been discovered during excavations. The wall abutting the moat encircling the fortress is one of the most arresting features. The garden city and the palace was built by king Kasyapa 477 - 495 AD. Then after king Kasyapa's death it was a Buddhist monastery complex upto about the 14th century. The Mahavamsa, the ancient historical record of Sri Lanka, describes King Kasyapa as a parricide, who murdered his father King Dhatusena by walling him up alive and then usurping the throne which rightfully belonged to his brother Mogallana. To escape from the armies of Mogallana, Kasyapa is said to have built his palace on the summit of Sigiriya, but Mogallana finally managed to get to Kasyapa and he committed suicide. However, there is also another version of the Kasyapa story, related by one of the most eminent historians of Sri Lanka, Prof. Senerat Paranavitana. He claims to have deciphered the story of Sigiry, written by a monk named Ananda in the 15th cent. AD. This work had been inscribed on stone slabs, over which later inscriptions had been written. Till to date no other epigraphist has made a serious attempt to read the interlinear inscriptions. The two conflicting versions have been the basis for the historical novel 'Kat Bitha' by daya dissanayake, published in 1998. 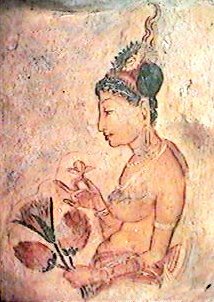 Sigiriya is also the location for Arthur C Clerks Fountains of Paradise. 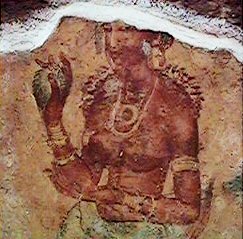 Recent excavations had revealed miniature terracotta figurines at Sigiriya, from the post Kasyapan period. 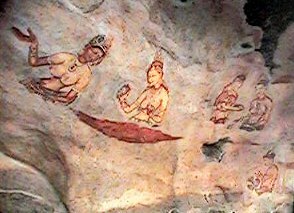 They are works of art which are miniature reproductions of the paintings on the Sigirya rock wall. They would have been sold as souvenirs for the visitors to Sigiriya Some of them are found at the Sigiriya Museum today. John Still in 1907 had observed that; "The whole face of the hill appears to have been a gigantic picture gallery... the largest picture in the world perhaps". The paintings would have covered most of the western face of the rock, covering an area 140 meters long and 40 meters high. There are references in the Graffiti to 500 ladies in these paintings. They would have been a breath-taking sight, when seen from the water garden below. Click on the thumbnails to view an enlarged picture.